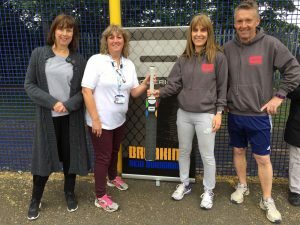 Earlier in the summer we were delighted to work with Joanne Mingo-Rawoo, senior Community Nurse with the Surrey and Borders Partnership NHS Foundation Trust, to provide a couple of Cage Cricket Sessions with two groups of adults with learning difficulties. Despite indifferent weather, we had two fantastic sessions with the players who showed a real relish for the game along with some great cricketing skills. We are currently seeking funding to allow us to run more sessions with these groups. In the meantime Joanne has kindly let us have some feedback from her professional colleagues who were present at the sessions. “What a great day everyone had! It was an opportunity for people who may not have come instantly to mind as a person who would enjoy or indeed cope with the activity to have a go in a safe & supportive setting. There were lots of very pleasant surprises in so far as unexpected people having a ball and showing some real aptitude, as well as people who we know love such opportunities excelling! It was a fabulous opportunity for a group of people who have challenges in accessing exercise and community facilities which people without a disability do not necessarily have to overcome. I really hope it runs again.” Lisa Poynor – RLDN, BSc (Hons) Specialist Community Practitioner (Learning Disabilities). Healthcare Planner, NHS Continuing Healthcare Team.